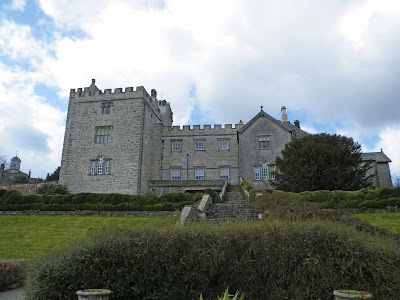 Sizergh Castle has recently undergone a period of in depth maintenance. For two years the exterior of the castle has been clad in scaffolding, essentially hiding the building from view...until now!! 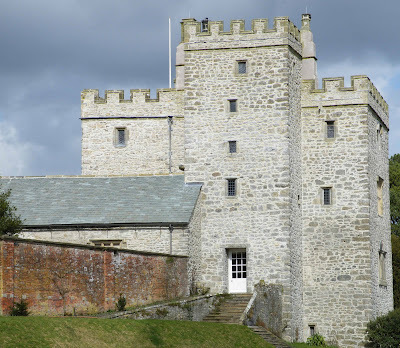 The scaffolding is down, and the newly re-pointed castle has been unveiled.....and what a fantastic job the restorers have done. Gone is the dour, dark exterior stone work, and gone is the (beautiful in Summer) ivy that previously clung to most of the tower. 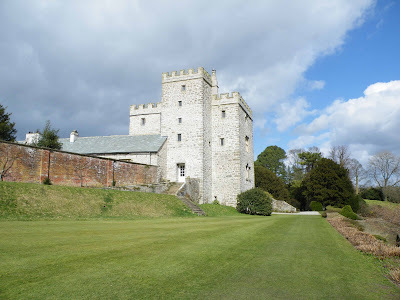 Instead, a pale limestone tower dominates the buildings looking out over beautifully manicured gardens. A view of the castle from the gardens below. This photograph shows the South facing, 14th or 15th century Deincourt tower to the left, the 15th century Drawing room with its terrace in the centre, and the 15th century Muniments tower to the right. A view of the castle from the South West from the drive. The stair turret can be seen jutting out from the Deincourt tower. A magnificent view of the Deincourt tower from the West across the well manicured lawns. The same view, but closer. The re-pointed tower shows off it windows much better now that the ivy cladding has been removed. 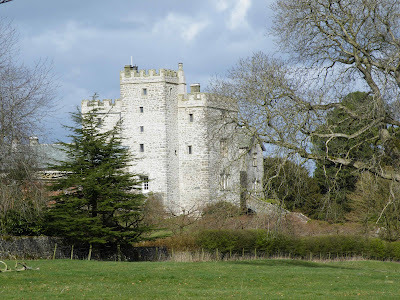 A classic view of Sizergh castle looking from the North into the courtyard. The Deincourt tower can be seen to the right of the photo, with the North face of the Hall in the centre. The 16th century Morning room can be seen to the left of the photo. To the right of the photo, disappearing behind the trees, are a line of buildings, erected in the 16th century, and containing kitchens, barracks, a chapel and laundry rooms. The line of buildings to the left of the photo, also date from the 16th century, and contained another kitchen and accommodation. Another view of the castle from the South, showing the Deincourt tower, the central Hall, and the Muniments Tower. A view of the Deincourt tower from the West in the walled garden. 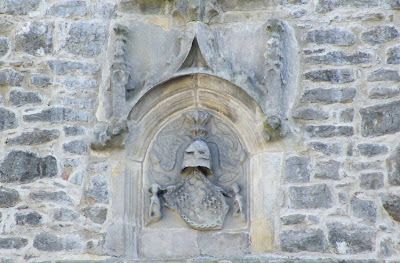 The armorial plate above the second floor window in the North facing wall of the Deincourt tower, probably dates from the 14th century, and is quartered with the Strickland coat of arms (top right and bottom left) and the, as yet, unidentified arms of another family. The castle is open to view now, and you can pay to see the house and the gardens, or just the gardens. Thank you for these photos and family history! My mother was a Carlton descended from a lineage reported by the Family Tree Maker that included the Stricklands and Hamertons, born in early 1500's. 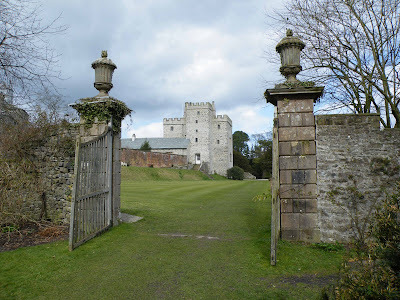 I found several websites about the castle, and enjoy seeing where my probable ancesters lived in Cumbria and later in Bradford in Yorkshire and Bradford (now Haverhill) in Massachusetts.